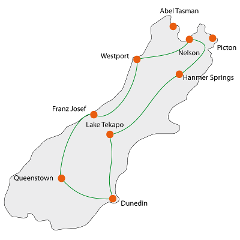 On this tour you will explore the absolute best of what the South Island has to offer. Fun, city, sun and awesome beaches with a full-day adventure at the Abel Tasman National Park. FOOD KITTY (+NZ$250) FOR THE TOUR NEEDS TO BE BOOKED!